The Institute for Advanced Jesuit Studies is now accepting applications for a three-credit European immersion course in the summer of 2018, the first of new graduate courses offered in the field of Jesuit Studies. These courses offered through the expanded Certificate in Jesuit Studies program present unique scholarly opportunities for participants to develop a deep, informed understanding of the spirituality, history, pedagogy, and leadership methods of the Society of Jesus and its apostolates. The three-credit immersion course examines the historical and spiritual contexts for the foundation of the Society of Jesus. It begins with preliminary online readings and discussions and continues in July with 13 days of informed, scholarly direction through Spain and Italy. 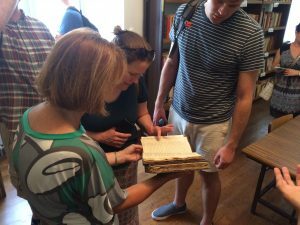 Participants immerse themselves in the key places that became the roots of the Society of Jesus and study a variety of primary sources to examine how and why the early Jesuits formed and governed their new religious order. A travel reader, daily presentations and writing assignments, and regular seminars foster thoughtful reflections on the historical and spiritual importance of each day’s theme. An annotated itinerary for our time in Europe and other course details can be found on the Institute’s website. Daily reflections from last year’s participants are also available online. Participants earning at least 15 credits will receive a Certificate in Jesuit Studies from Boston College. Individuals not pursuing a Certificate may also apply to immersion course or future online courses in Jesuit pedagogy and Jesuit history. The application deadline for the immersion course is February 1, 2018. An application is online.